THE old umbrella, for ages untouched by the forward moving wheels of progress, has responded to the spirit of the times with the addition of a new front window to afford better vision. Hitherto, the umbrella user either had to carry his umbrella so high that it was of no practical use, or he pulled it down and took reckless chances of collision with oncoming pedestrians. 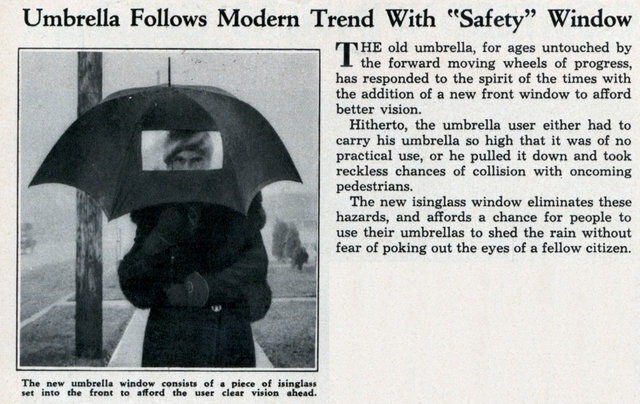 The new isinglass window eliminates these hazards, and affords a chance for people to use their umbrellas to shed the rain without fear of poking out the eyes of a fellow citizen.